Help make a difference in the lives of those in your community! PROFESSIONAL-LEVEL VOLUNTEER Serve on a volunteer committee, assist professional staff with one-time projects, or provide self-sufficiency education on an as-needed basis. OTHER OPPORTUNITIES Volunteer at the LifeSpan offices, help with special events or represent LifeSpan in the community. For more information about volunteering at LifeSpan, contact our Community Relations Director at (513) 868-3210 or info@lifespanohio.org. ELDER VICTIM ADVOCATES After training with our knowledgeable staff, volunteers provide information regarding victim rights, referrals to other services, emotional support, assist with financial restitution, and accompaniment to appointments such as health, legal, and law enforcement. Volunteers have constant, ongoing communication with our dedicated staff. Every year the need grows for more compassionate, committed volunteers. If you are interested in becoming a volunteer Elder Victim Advocate, please complete the form below and our Volunteer Coordinator will be in touch with you in four to five business days. 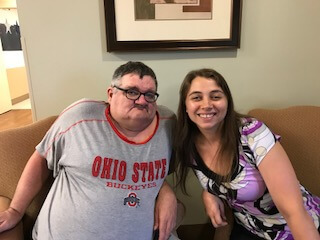 FRIENDLY VISITORS After training with our knowledgeable staff, volunteers develop personal relationships with clients through twice a month visits. Volunteers have flexibility when scheduling visits. Volunteers have constant, ongoing support from our Guardianship team. Every year the need grows for more compassionate, committed volunteers. After six months, you may decide to enhance your relationship to become the legal Guardian of the client. If you are interested in becoming a Friendly Visitor, please complete the form below and our Volunteer Coordinator will be in touch with you in four to five business days.